This weeks challenge was to make an ornament....Well I just couldn't make one, so I'm sharing a few different ideas with you. At the bottom of my post you'll find a few links to other ornaments that I've posted in the past on my blog. I hope this gives you some creative ideas for your Christmas Ornaments. 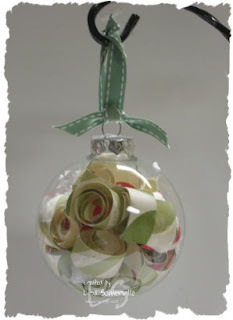 Be sure to check out my fellow Blog Challenge Players Ornament ideas, their links are on my sidebar. 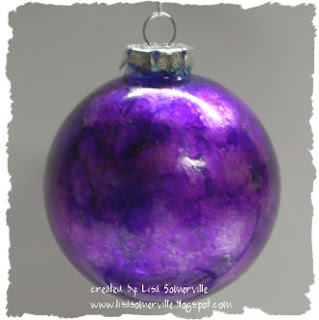 For this next ornament, I used the same type of glass ball shown above, and added some Ranger Alcohol Inks, and Metallic Mixatives to resemble the Polished Stone Technique. I added some Silver Elastic Cording to hang the ornament. Don't forget to order your Trim the Tree Kit - email me for more details! Love your little snowman ornament the best, but all of them are sweet!!!! Great job. I too made one of those that you roll your paper in. Those really are pretty and so easy. I love the snowman one. These are all fabulous ideas! It's amazing how many beautiful ideas are out there. Super CUTE ideas!! love the variety. WOW you did THREE!! Good for you! I love them all. I like the rolled paper one. Ohhhh three ornaments -- lvely - I really like the little tin, though -- so cute! Well, for my ornament, I was going to copy Mary Jo... then I saw your snowman tin, and thought... no, I'll do that one, 'cause I have a bunch of those tins... then I saw the rolled paper ball... and thought "oh that's really pretty, and it doesn't involve any stamping, I'll do that one"... I don't have any Ranger inks, but now I'm trying to figure a way to do that one! Thanks for the confusion! LOL. BTW, fabulous job, as always! Great ornaments Lisa! I love the rolled up designer paper. So easy and yet very visually striking. What a great way to use up those scraps that I can't bear to throw away. I could hardly do one...and you go and do THREE! ;-) These are terrific! I've never seen the rolled paper idea -- it's SO pretty! Great ideas! I like the idea of the "rolled paper" ornament. Your ornaments are fantastic! What a great variety to show everyone. I really like the tin! Lisa, those are all great ornaments. I do love the first one, love the colors of it! Lisa, these are all fantastic! Thanks for sharing all of these different ideas. LISA! These are awesome! 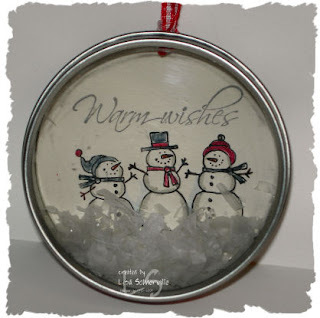 I love the snowmen and I LOVE the super simple but elegant idea of the DSP roll ornament! Excellent! All 3 are great, of course! But I just love the one with the designer paper strips - what a great idea! OMGoodness! How cute is that Snowman Ornament! Love them all but I am a Lover of all things Snowmen!! There are now 2 clear top tins I need from this site .. thanks for sharing it with us! I LOVE all of your great ideas! TFS! these are all great ideas Lisa!! I used your tutorial for the scalloped circle ornament for mine this week! thanks for the instructions! !